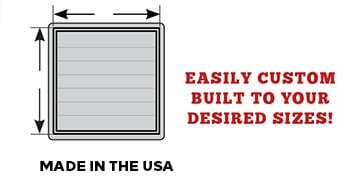 The patented EcoTight Shutter will improve your fan efficiency and reduce cold air leakage. Manufactured to your desired custom size, the EcoTight Shutter is made of heavy-duty, durable twin wall profile frame for longer life and stability. Its aerodynamic design allows for maximum air performance while minimizing light into animal room. Based on a 30" shutter testing (airflow only - not on a fan), the EcoTight Shutter had 21.8% more airflow and 17.1% less air leakage than Double L's current PVC Shutter. 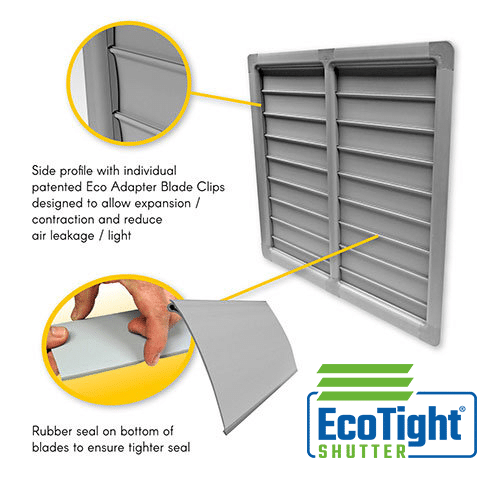 A key feature of EcoTight Shutters are the side profile with individual patented Eco Adapter Blade Clips designed to allow for expansion and contraction while reducing air leakage and light. No blade flip-over or blades getting stuck in the open position. A rubber seal on the bottom of each blade ensure a tighter seal. Each blade pivots on a continuous fiber rod. Excellent cleanability with durability to withstand pressure washing.